Review: The Dinosaur that Pooped the Past (giveaway at the bottom). 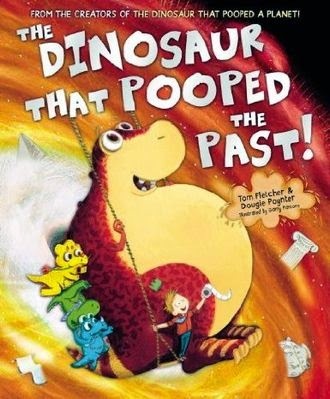 The Dinosaur that Pooped the Past by Tom Fletcher and Dougie Poynter is rhyming children's book. It is the third book in the series and that bodes well for us readers. It can be a fickle business in the world of children's picture books. Danny and his dinosaur (no name) are at grannies birthday for lunch. Grannie isn't really a great cook and every thing she serves is green! Luckily dino licks up Danny's plate and off they go outside to play. Outside is a magical swing which Danny and dino love to play on. The swing transcends time but when the rope snaps mid swing it sends them hurtling through time and space, and the past! They are stuck there unless they can fix the swing. Like many children's books these days, many are in a sing song rhyming rhythm. This is great to help kids associate how words are similar spelt (and sometimes how they aren't). Yet, due to the lengthy nature of the book, I felt that not every single sentence needed to rhyme. It felt forced at times. While it isn't a clever story, I think kids will naturally gravitate towards a book like this. It has dinosaurs and poop. Does it matter if the content isn't clever, as long as kids pick up books and read? That's the bottom line in my opinion, if it will get kids reading, that will do. I have one copy of this to give away thanks to Randomhouse NZ. If you an NZ postal address I can send this to, then you can enter. Simply comment in the comments section to enter! Entries start from now until Monday 22nd September at 11:59pm. (You can also enter on Facebook). 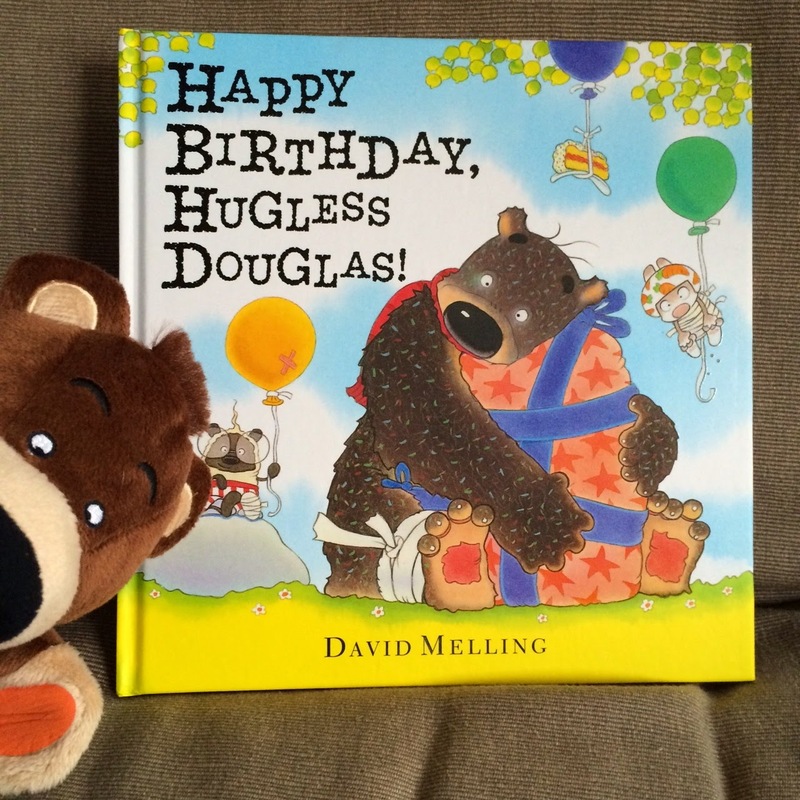 Happy Birthday, Hugless Douglas! is the latest is the series of Hugless Douglas. I haven't read any of the previous books in the series, so I don't actually know why he's called Hugless. This book is about how Hugless Douglas's twin cousins ruin everything when they come over. They open all his presents without asking and in the midst of it, Douglas bounces off on his new pogo stick to lament his worst birthday ever. What's great about this book, is the kids and I can relate to the story. My (school) kids all have had a little brother/sister or friend ruin something, either their drawing, toys or something else. There was a lot of humour and silliness which all kids love (me too). The pictures are also super cute as well. I've found that a lot of picture books and cartoons/comics for kids in general have really moved towards the cuteness factor. Even 9/10 year old boys love it. However, the overused cliche ending, 'worst birthday ever' to 'the best birthday ever', is droll. The kids even groaned at that ending. Sure, write it as a happy ending, but using those exact word... children these days are more sophisticated than that. Overall a good book and I wouldn't mind checking out the other in the Hugless Douglas series.